Strange after spending two weeks in Japan chasing cherry blossom (and being always a week too early), that there is a great display in Cambridge now that I’m home. 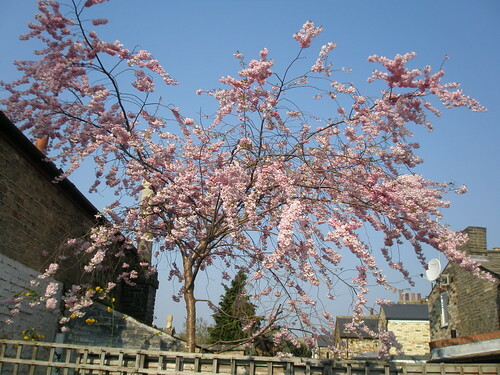 I haven’t really noticed the cherry blossom as anything special before, but I’m seeing it with a new eye now. A test for Michael: what’s missing from the photo below? Up for flight and on the transfer bus at 8am, out to Kansai Airport. The runway is in the sea, which made for an interesting take-off. The flight was only half-full and we were lucky enough to get extra leg room seats at the start of the economy section + an empty seat between Rob and I, so it was very luxurious and almost felt like being in premium economy. Unusually, I managed to do some work on the flight on my laptop because it was so comfortable and because it was a daytime flight. Sarah and I watched a film recommended by Rob: The Usual Suspects. Kevin Spacey was very good. Managed a two hour snooze early in the flight. More work then another film. It was actually a very good flight. We were half an hour late arriving at Heathrow and it took three hours to get home to Cambridge, across country becasue the M25 was at a standstill. Professor Shirota met Robert, Sarah, Richard, Alejandra and John and I at 8.15 at the hotel and we went out to the Suita Campus of Osaka University to visit Applied Chemistry in the Faculty of Engineering. 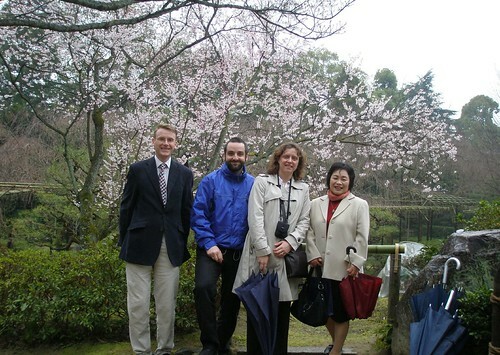 Rob, Sarah and I met with Professor Fukuzumi for the morning and gave our presentation, whilst the others went to discuss different things with different people. We all met up together for lunch at La Sensa Italian/French restaurant on the 12th Floor of the Chemistry building: run by one of the hotel chains and also open to the public, although it would be a strange place to visit for lunch. We had a western-style fish lunch, which was very good (and smothered in garlic). After lunch Prof Fukuzumi drove us to the Toyonaka Campus where we had two sets of labs to visit and we gave our second presentation of the day and had some other meetings and a quick lab tour. 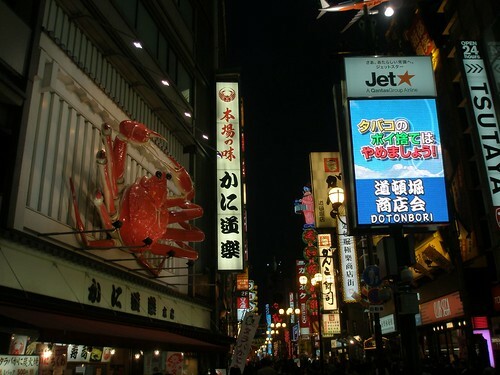 Professor Shirota took us back into town and we visited the old-style Osaka, in I think Namba, with lots of narrow streets, low-rise buildings and bright lights. It was a completely different atmosphere and was very busy and frenzied, with lots of noise. There was an amazingly long covered shopping street, crammed with lots of shops (mostly looking empty). 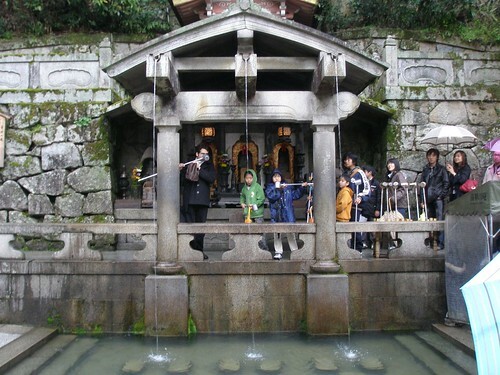 We also stopped at a shrine, where passers by prayed and sprinckled rocks with water from a bucket, keeping lush moss on the stones and statues wet. We all had a quick go at this. Headed back to a hotel restaurant close to the Granvia and Yas and Nobuka bought us an amazing meal, accompanied by Hiro. We started with a selection of little dishes, including octopus and a green plant that looked like fern tips. This was followed by some lovely soup and then the best sashimi we’d eaten: tuna, squid and sea bass all of excellent quality. 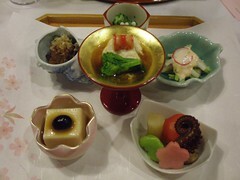 We followed this with a little pot of vegetable stew and a shared a selection of vegetable tempura. We also had a baked sea bream course. Rob, Sarah, Ale and I were in stitches over this because while three of us had decent servings Ale’s was mainly a pile of bones and a huge fish eye! She’s complained about this rather plaintively and held a bit of bony carcass up for effect: we couldn’t stop laughing. This was accompanied with beer and three flavours of sake: clear (dry and not dry) and a beautiful cloudy sake, that was wonderful. We had a great night. After dinner we headed up to the top floor of the building (35) where Professir Shirota had booked a private room and we had more drinks there, with an amazing view. Richard fell asleep (jet lag) and by 10.30 we headed off and Yas showed us how to catch buses to the airports from various spots around hotel. His hospitality was amazing. Richard, Rob and I went to the top floor of the Hilton across the road from our hotel to the tacky Window on the Sky (or something) bar for a nightcap. The place was decorated with etched glass brightly lit by garish spotlights in yellow and pink, and accompanied by other twinkling and lit decorations, such as a stand of glasses lit internally to illustrate various cocktails. There was a Swedish singer and we ate some powerful wasabi-coated nuts. 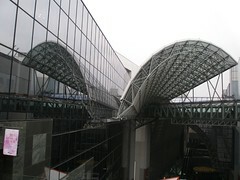 In the late afternoon we popped out to the Daimaru and Yodobashi Camera Department stores. The first is located in the first 13 floors of the same building as our Granvia hotel and the second was about 10 floors of mostly electronics. These are mega shopping centres. We bought a few gifts, including lucky cats for our desks at work. Sarah has so many that she’ll need to give up working soon to concentrate on spending all her new fortune. 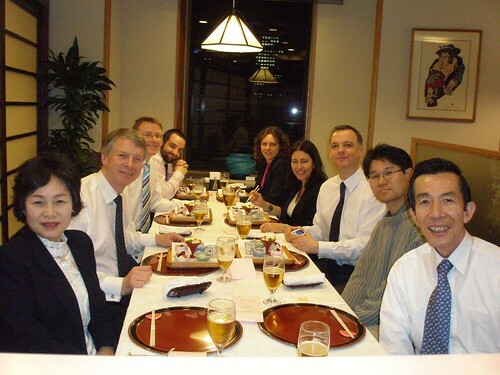 In the evening we met up with Richard, Alejandra, John and two of the delegates in a tonkatsu restaurant which was very good. This was on the 13th floor of the hotel, and we had to use a special elevator to reach it as it was outside of the ‘hotel restaurant collection’ and a lot cheaper too!. We learned that one of the UK delegation had eaten a dodgy prawn last night and had to make an emergency trip to the loo in a temple. Only to discover there was no toilet paper. So they had to unwrap a present they had bought for their partner and use the wrapping paper (ouch). When this ran out all that was left was 30 of their business cards, which made very useful scrappers. Being quite made of stiff card they blocked the toilet and also identified the culprit! They should expect an e-mail from the cleaner shortly! 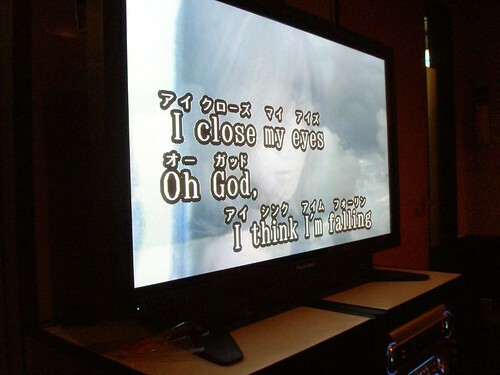 Feling a bit jaded after last night’s karaoke session, and it’s just as well that today is a quiet day. We had originally planned to visit Osaka City university in the morning and Osaka Prefecture in the afternoon. However, most professors take today off after the Chemical Society of Japan Spring meeting, so there would be few people there to visit and Professor Shirota had found it very difficult to find anyone who would be around. After breakfast with Sarah, I worked in my room sorting out paperwork from the meeting and my e-mail box: still clearing messages received while I was in Argentina. I’ve just cleared the inbox, and know what I need to do next, so that’s a good start. Lunch was a bit gruesome: we wandered to the mall under the hotel and had pasta. My carabonara had a cheap cheesy sauce with lots of garlic. Going to continue with e-mail and sort out expenses until about 4 or 5, when I’ll meet up with Robert and Sarah. Raining a little today and had a slow start. 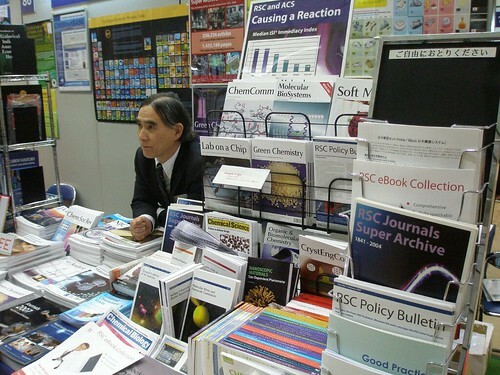 Met Harutoshi at the stand and spent all day there, which was very useful, including meeting the Editor of the Chemical Society of Japan’s equivalent to Chemistry World. Sarah and Rob spent the day between an International Asian Sympoium (in English) and the Green Chemistry Symposium that Alejandra organised. Both seem to have gone very well. In the evening we attended a reception for this event, that followed the same format at the reception last night. The band played supercalafrgulisticxbalidocious (which is a favourite in Japan) and the theme from Beauty and the Beast. They opened the beer earlier tonight but this meant that the RSC award giving was competing with chat from the delegates. 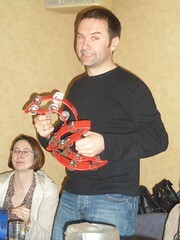 The PCCP Award winners were very pleased with their prizes and I got some good photographs for RSC News. We met up with the UK Green Chemistry delegates after the reception and 12 of us went back to the same Big Echo karaoke bar that went to on Sunday night. We spent about 4 hours there and made a lot of noise! We were party crashed by some local youths (about three times). 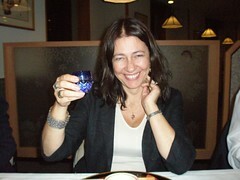 Met Alejandra for breakfast in the Japanese restaurant. We had a pretty intense and large rice and fish-based breakfast. I met up with Mark, Sarah Rob on the platform of the Hankyu Railway out to Kansai University. They were heading to sessions and I was meeting up with Harutoshi on the stand. 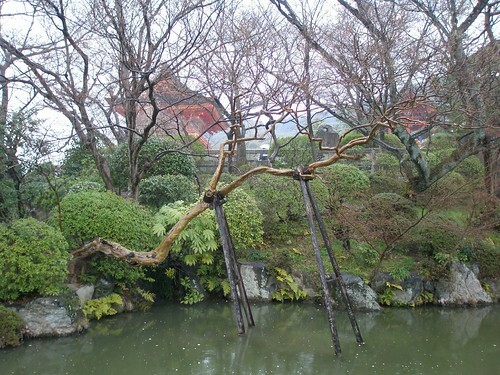 He and I headed out to Osaka University to meet four librarians to discuss contracts and pricing: I was there to add gravitas to the discussion what was almost totally in Japanese. 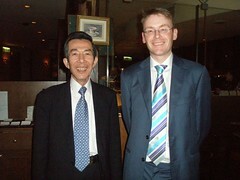 Harutoshi started of the meeting by talking solidly for 20 minutes, interspersed with explanations for me. It was these that stopped me dropping off to sleep and after 20 mins of listening I was really fighting to stay awake. I was able to help out with some technical and policy issues. 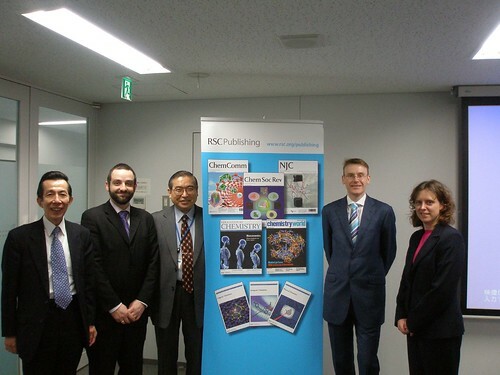 Spent more time on the stand before going to the Chemical Society of Japan reception for about 200 of the 9000 delegates. The reception started with an orchestra that played James Bond themes and the Carpenters: in a solemn way. 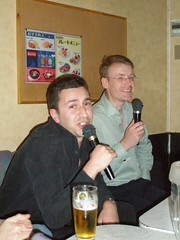 We then had speeches, including a fantastic speech from Richard Pike in Japanese. There was an audible ‘wow’ from the audience when they realised that it was more than ‘Good Evening’ and this was a big hit with them. In total the music and speeches took a little over an hour! Finally the beer was opened and we could eat the food we’d been standing by all this time. The beer was opened for a toast and I had (rudely) drunk most of mine unconsciously before the toast. After the reception there was more talk of karaoke, but the English delegates would all be speaking at a Green Chemistry Session the next day and jet-lag had taken it’s toll too. We retired to the hotel bar and had an early night (12.30!). 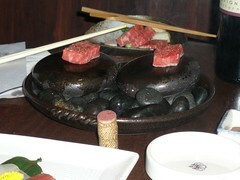 Rob ordered some beef to cook on hot stones, whih had smelt lovely when others had it on previous nights. 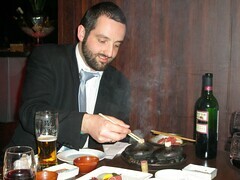 The white lumps weren’t tofu but lard to coat the stones with before frying the beef, so it got rather smokey! 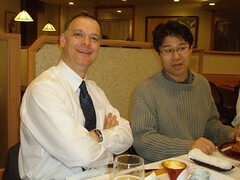 Professor Shirota met us at 8.15 at the hotel to take us out to Kansai University in Osaka. He bought us our tickets for the week and then we were on our own for the train. We took the private Hankyu Railway from Umeda out to Kandaimae. We followed the crowds up to the university and managed to register and buy programmes very quickly. All very smooth. We found Harutoshi had already set up the exhibition stand and he helped us translate the programme into English, but this wasn’t really enough and I went to buy the two-volume book of abstracts and CD (£100) so that we could find out what was going on. Rob and Sarah went to some sessions while I stayed on the stand. The sessions were in Japanese and without a detailed programme it was impossible to plan to meet people to target good talks. We headed back to the hotel for lunch and to work on the programme. We met up with Mark, Alejandra and John Baird for lunch, then spent the rest of the afternoon working through the sessions, translating from Japanese to English from the CD using Google Translate on the web: It did a good job. In the evening we went to a British Embassy/RSC reception across the road in the Hilton. Many of our Editorial Board members and hosts from our different universities were there, so this was excellent for making contacts. 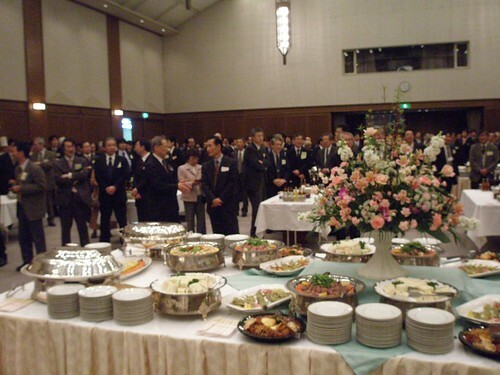 There were various speeches and good food and beer. 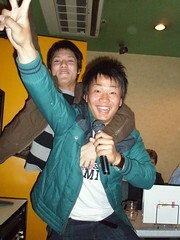 A group of us wandered out to a karaoke bar close by, that Dr Imae had found for us. It was the room with sofa and TV variety but we spent a good couple of hours with some beer, crooning away to classics from a strange mix of songs, selected from an interface that was largely in Japanese, Excellent fun! Took the Shinkansu from Okayama to Osaka, where we were met by Professor Shirota, his wife Nobuku and one of his Associate Professors, Hiro. We left the platform early at Osaka station and so managed to miss Professor Shirota and his wife. Luckily they’d covered all possibilities and Hiro was waiting to intercept us at the hotel! This is our third Granvia (and sadly the worst of the them so far). We’re here for 6 nights. 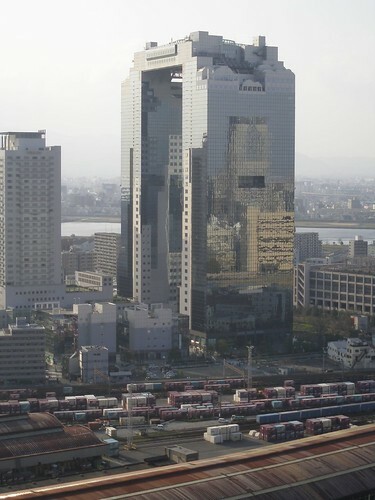 There is a good view of the Umeda Sky Building from my room, which is compensation. 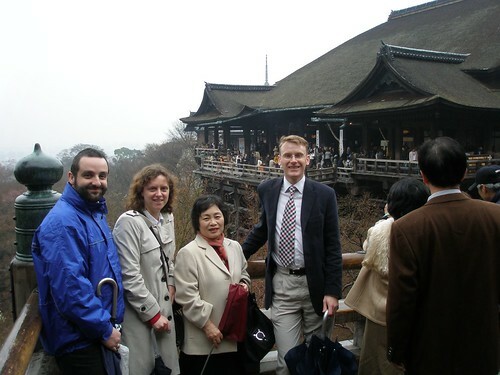 Today’s Saturday and Nobuku and Hiro took Sarah, Robert and I for a great tour of Kyoto starting at the Heian Jingu Shrine and torii. 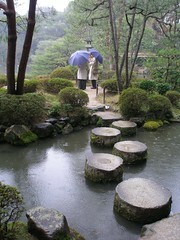 The shrine had very beautiful and peaceful gardens, which we explored in the gentle rain. The cherry blossom was just opening and there were cherry and plum trees in flower here and there , but the main blossoming is probably a week away. Apparently the gardens are very busy then, and we were lucky to be able to enjoy both the tranquility and the cherry blossom today. I also enjoyed spotting myrtle trees (one for Michael) that I’d first seen in Argentina only a couple of weeks ago. Nobuku and Hiro took us for a beautiful lunch at Rokusei. We had a bento ‘bucket’. The main little dish contained little raw elvers which were good to try. We had to walk through a wedding photo lineup on out way out. 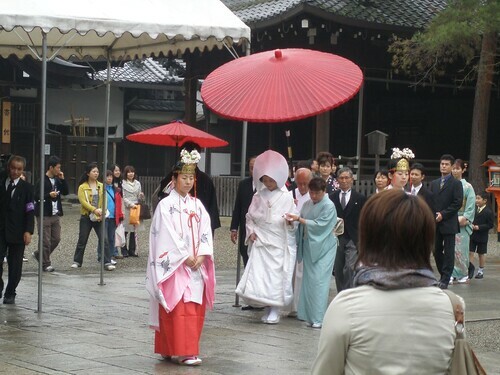 Rokusei is a popular place for wedding functions apparently. 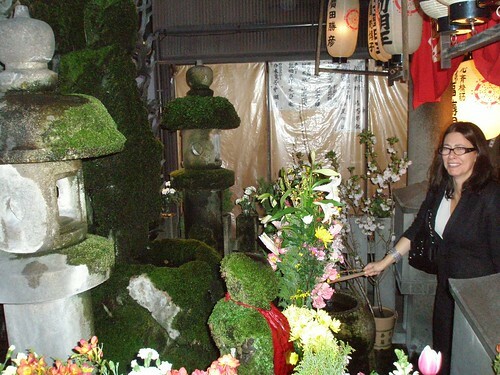 We wandered around some atmpospheric streets, dipping in and out of shops and passing through another temple where were close to a shintowedding party. 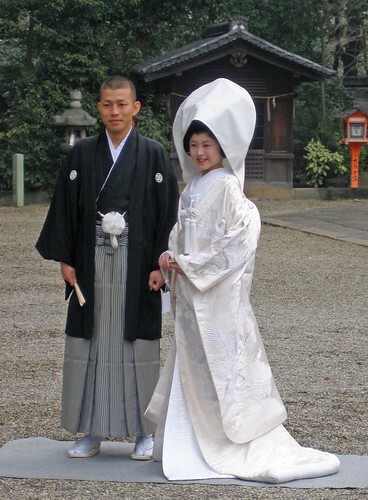 The party as a whole was sombre in contrast to a western wedding: no smiling faces during their formal walk across the shrine grounds. After the ceremony the bride was smiling for the photographs though. I think there were six weddings happening at the same time. We stopped for some matcha tea and mochi (small rice jelly sweets) covered in soy flour and matcha. Rob loved the matcha tea so much that he’s now our matcha, matcha man. Onwards to visit the huge Kiyomizu Templewhich is a famous Buddhist temple, built on wooden platforms on the side of a hill overlooking Kyoto. 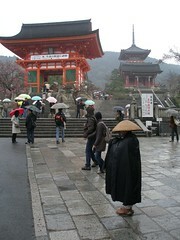 There had been gentle rain for most of the day so the view of Kyoto from the temple was obscured. 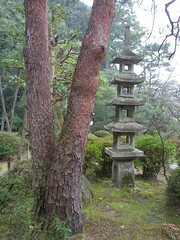 Despite the crowds there was a lovely feeling of tranquility. 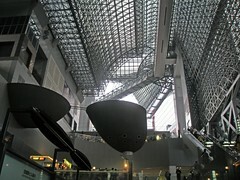 We wandered through the temple gardens to various viewpoints and to see the Otowa-no-taki..
Nobuku and Hiro took us shopping in the massive and massively impressive Kyoto Station Shopping Centre. Rob bought some matcha and a bamboo whisk to make it. The matcha came with preciseinstructions on how to prepare the tea. I bought a bag of green tea, then went a bit mad and threw in a bag of rice tea and a bag of posh green tea tea bags. The Japanese green tea is very nice but I couldn’t find or explain well enough how to get the very fresh, almost sea-weed flavoured tea that we had at Okayama university. I was tempted to buy a set of rice bowls but they worked out between £5-£30 per bowl. We met Professor Shirota for dinner at the New Miyako Hotelwhich is very smart and we had a very nice western-style meal, with red wine and rare beef, soup and fish courses. The French wine was very fine. We were all a bit tired after our walking the city and Professor Shirota’s arrival and good company livened us all up again. 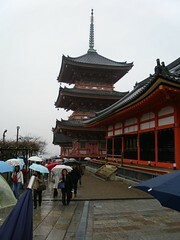 It was a wonderful day in Kyoto. Rob went to bed earlier than Sarah and I last night. 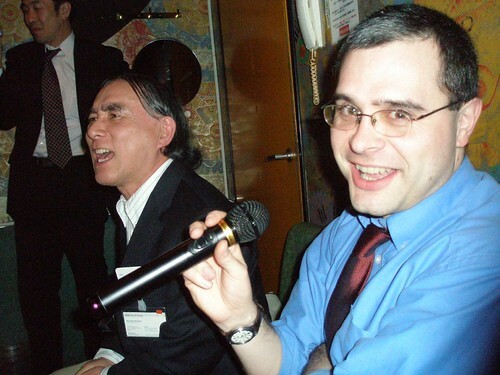 While we were having a nightcap in the bar at the top of the hotel, Rob was investigating karaoke bars with some of the students, none of whom knew what a ‘pub’ was. The karaoke bar turned out to be a private room with a sofa and TV. With the prospect of my karaoke debute being only infront of such a small audience, I decided to maintain my dignity for a few more days in search of the limelight and more appreciative spectators. After trying in vain for one last beer I retired to bed only to spend the next 1 hour trying to understand the telephone instructions to ring internationally, a problem also encountered by more senior members of the travelling crew! On this occasion ‘international rescue were called and members of the hotel promptly informed Dr McCann that contrary to the room guidance of dialling “0” the actually code was 0 010 0410?